Heston Silbert was appointed Deputy Director of the Department of Public Safety in February 2015. Deputy Director Silbert retired from the Phoenix Police Department with 22-years of service. 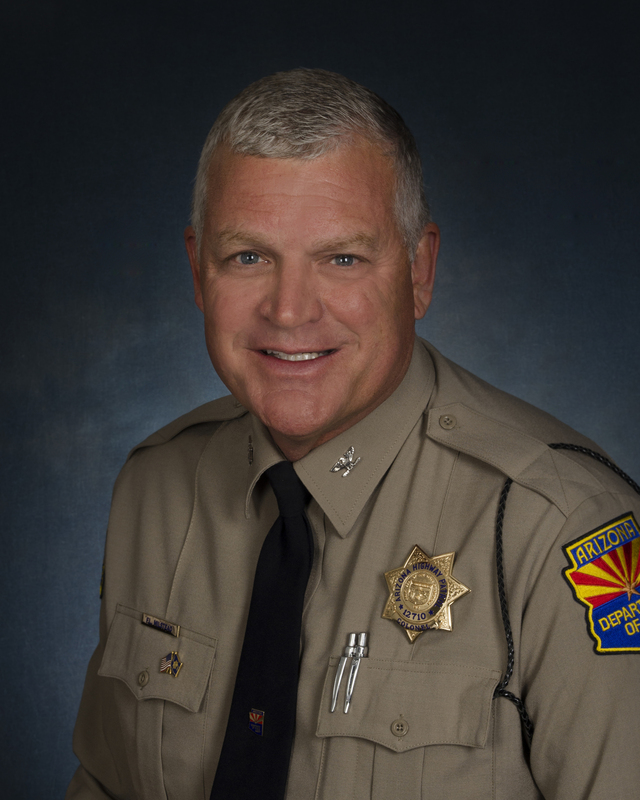 After his retirement from the Phoenix Police Department, he was hired as a Commander by the Mesa Police Department, where he assumed command of the Red Mountain Division. In May of 2011, he was promoted to Assistant Chief of Police for the Operations Bureau, and in 2013 he was promoted to Executive Officer. Deputy Director Silbert began his career as a patrol officer in South Phoenix at the South Mountain Precinct. After working in a patrol capacity he was transferred to work on a proactive enforcement squad that conducted gang and drug investigations. During this assignment, Deputy Director Silbert also worked in an undercover capacity. Deputy Director Silbert continued his career working street gangs, but also mentoring at risk youth in the Foothills Housing Projects of South Phoenix, where he was a PAL officer. After this assignment, he continued to investigate street gangs as a detective on the Night Gang Enforcement Unit in the Organized Crime Bureau. Deputy Director Silbert was also a member of the FBI Violent Street Gang Task Force where he and members of the unit conducted wire-tap and conspiracy investigations. After his assignment in the Gang Unit and the FBI Violent Street Gang Task Force, he was selected to be a member of the Special Assignments Unit (SAU/SWAT). After several years with SAU, Deputy Director Silbert was promoted to sergeant where he worked at both the Squaw Peak Precinct and again in South Phoenix at the South Mountain Precinct. During these years he was selected as Supervisor of the Year and Police Officer of the Year. After his assignment as a Field Training Sergeant in South Phoenix, he was promoted to lieutenant. As a lieutenant he served in Patrol, Systems Integration, the Vehicular Crimes Unit, the Special Assignments Unit, the Police Academy, and as Unit Commander of the Major Offender Bureau’s Fugitive Apprehension Unit and Career Criminal Squad. Deputy Director Silbert holds a Bachelor’s Degree in Education. He also holds a Masters Degree in Public Administration from Arizona State University. He is a graduate of the Northwestern University School of Police Staff and Command, the FBI National Academy and is also a graduate of the Police Executive Leadership Institute. In April of 2015, DPS Director Frank Milstead promoted Danny Lugo from the rank of Major to Lt. Colonel and assigned him as Assistant Director of the Highway Patrol Division. On August 5th, 2017 Lt. Col. Lugo was appointed to the Assistant Director position over the Criminal Investigations Division, a division he has served for approximately twenty-two of his thirty-one-year career. In March 2019, Lt. Col. Lugo was appointed to the Assistant Director position in the Agency Support Division, where he serves currently. 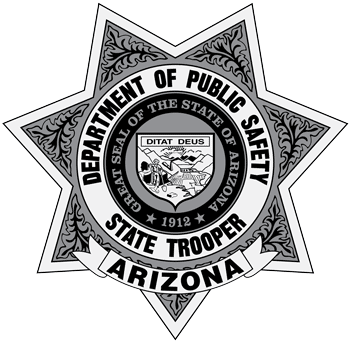 During his thirty-one years as an Arizona State Trooper, he has held a variety of positions in the Highway Patrol Division and the Criminal Investigations Division throughout the state. Lt. Colonel Lugo has spent approximately twenty-two-years of his career in the Criminal Investigations Division serving in several multi-agency task forces. Prior to his promotion, he served as the Investigations Bureau Commander over statewide Narcotics Enforcement, Auto Theft Task Force, SWAT, and Homicide Investigations (Major Crimes Unit) at the rank of major. Lt. Colonel Lugo served for approximately three years as the full-time SWAT Commander and has approximately 17 years of total SWAT experience as a SWAT Operator, Assistant Team Leader, Team Leader and Commander. He served three years as the Highway Patrol District Commander in Tucson and approximately one and one-half years as the State Gang Task Force Border District Commander, both at the rank of captain. Lt. Colonel Lugo was assigned to the State Gang Task Force on four separate occasions throughout his career and one year as a Border Intelligence Commander, at the rank of lieutenant. As a sergeant, he served a three-year assignment at the Arizona Counter Terrorism Information Center (ACTIC), which is a multi-agency intelligence fusion center. His additional assignments in the Criminal Investigations Division as a sergeant were in the areas of Financial Investigations, Administrative Sergeant, Intelligence Supervisor, Undercover Narcotics Detective and Supervisor, Major Offenders Unit Detective and Supervisor, Meth Lab Task Force Supervisor, State Gang Task Force Supervisor (as well as a Detective), and SWAT Team Leader. Lt. Colonel Lugo attended the Arizona Law Enforcement Training Academy, the Pima County Corrections Officer Basic Academy, and honorably served four years in the United States Marine Corps with assignments in Japan, South Korea, and California. He is a graduate of the Northwestern University School of Police Staff and Command and the West Point Leadership in Police Organizations (LPO) Command program. In March of 2016, he graduated from the FBI National Academy Session #263 in Quantico, Virginia. Lt. Colonel Lugo has a Bachelor of Science Degree in Organizational Leadership. Lt. Colonel Lugo was instrumental in starting the Tucson Chapter of the Latino Peace Officers Association (LPOA) and served as Tucson Chapter President for two years. He is also a Lifetime Member of the LPOA. He is a proud member of the Arizona State Troopers Association (ASTA), State Troopers Coalition, International Association of Chiefs of Police (IACP), Arizona Association of Chiefs of Police (AACOP), National Tactical Officers Association (NTOA) and the Fraternal Order of Police (FOP) Lodge 32. In April 2015, Department of Public Safety Director Frank Milstead promoted Major Ken Hunter to Lt. Colonel and assigned him as the Assistant Director of the Criminal Investigations Division. Shortly after his promotion to Assistant Director, the career criminal squad was established to focus enforcement efforts on white supremacists, prison gangs, separatists, and career criminals. Lt. Colonel Hunter began his career with DPS in September of 1989 and has held positions in the Highway Patrol, as well as the Criminal Investigations Division. He began as a patrol officer and advanced into the specialty motor, commercial vehicle, and gang enforcement units. 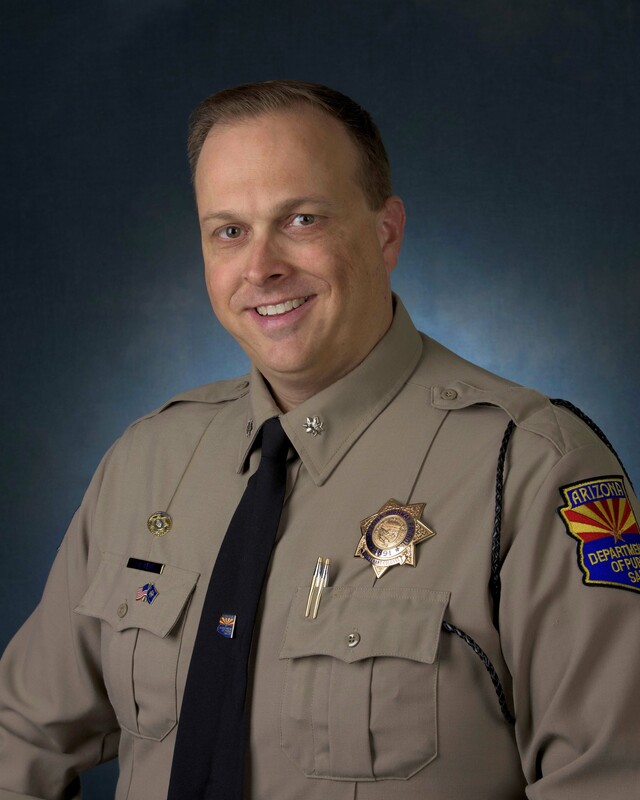 He promoted to Sergeant in 1999 and held positions in the State Gang Task Force, the Professional Standards Unit, and the Arizona Law Enforcement Academy. A 2004 promotion to the rank of Lieutenant and District Commander took him to assignments in Criminal Intelligence, the State Gang Task Force, Commercial Vehicle Enforcement, and the Canine Districts. In 2014, he was promoted to Major, overseeing the Special Enforcement Bureau responsible for commercial vehicle enforcement, canine handlers, criminal interdiction, and the Capitol Police District. Lt. Colonel Hunter has received several awards throughout his career – most notably the Meritorious Service Award, Director’s Unit Citation, and Officer of the Year. Lt. Colonel Hunter has a Bachelor’s Degree in Public Safety Administration from Grand Canyon University. He is a graduate of the Northwestern University School of Police Staff and Command, and the Leadership in Police Organizations Command Program. In January 2016, DPS Director Frank Milstead promoted Major Wayde Webb to Lieutenant Colonel and assigned him as the Assistant Director of the Agency Support Division. On August 5, 2017, Lt. Colonel Webb was appointed to the Assistant Director position over the Highway Patrol Division. Lt. Colonel Webb began his career with the Department of Public Safety in June 1994, as an Officer Trainee in Kingman. Upon graduating from the Arizona Law Enforcement Training Academy in Tucson, he was assigned to the Phoenix Metro Highway Patrol Division. In January 2000, he transferred to the Vehicular Crimes Unit and then later to the Special Investigations Unit as a detective. In May 2004, Lt. Colonel Webb was promoted to the rank of Sergeant and remained in the Special Investigations Unit in this new role. His responsibilities broadened and he was now leading investigations in high profile cases such as officer involved shootings as well as technical cases involving other police agencies. In August 2005, Lt. Colonel Webb transferred to the Highway Patrol Division where he served as the Administrative Sergeant in the Division Office. October 2007, brought him a promotion to Lieutenant and with that a new assignment as the Human Resources Assistant Manager. Lt. Colonel Webb remained in this position until July 2009, when he was assigned to Youngtown where he served as the Metro West Highway Patrol District Commander. In February 2010, he was appointed by the Director to serve as the agency’s Legislative Liaison. During this, Lt. 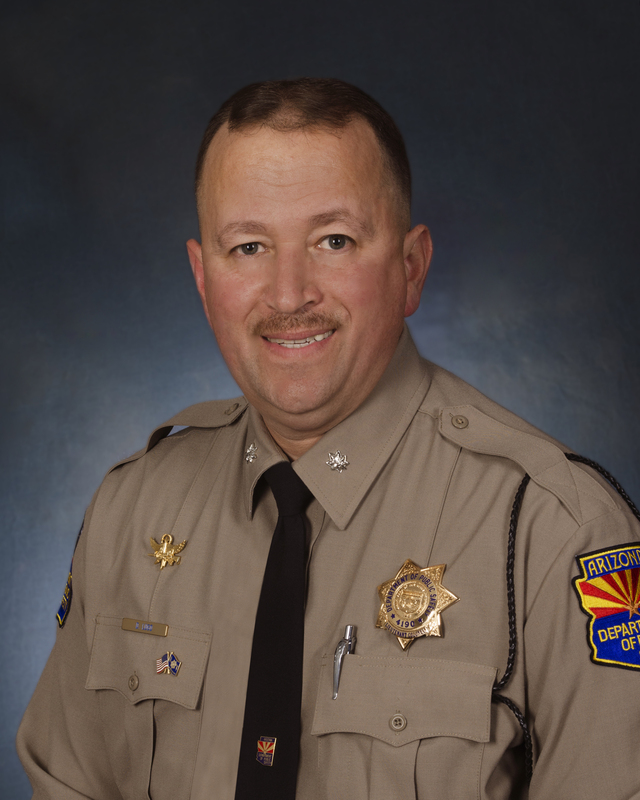 Colonel Webb was appointed as the Interim Chief of Police for the Town of Wickenburg. June through September of 2010, he assumed these additional responsibilities while the town searched for a new Chief of Police. After this three-month period, Lt. Colonel Webb returned to his previous duties as the agency’s Legislative Liaison. In June 2012, Lt. Colonel Webb was appointed to serve as the Executive Officer to the Director where his responsibilities included oversight/management of the following programs/units: Legislative Liaison, General Counsel, Governor Security, EEO, Public Information Office and Aviation; he promoted in place to the rank of Major in May 2014. He served as the Executive Officer for two Directors, to include Colonel Frank Milstead. In June 2015, he returned to Metro Highway Patrol as the Metro Bureau Commander. There, he ultimately managed a bureau consisting of almost 400 personnel to include Highway Patrol, Motors, Commercial Motor Vehicles, Capitol District, DUI Special Enforcement Squad, Freeway Service, Reserves and Student Transportation. Lt. Colonel Webb has been the recipient of the Criminal Investigations Division, Major Crimes Investigations Employee of the Year and Agency Support Division Commander of the Year awards as well as receiving two Director’s Unit Citation awards. Lt. Colonel Webb received his Associates Degree in Law Enforcement Technology from Rio Salado Community College and earned a Bachelor of Science in Occupational Education, Human Services, from Wayland Baptist University. 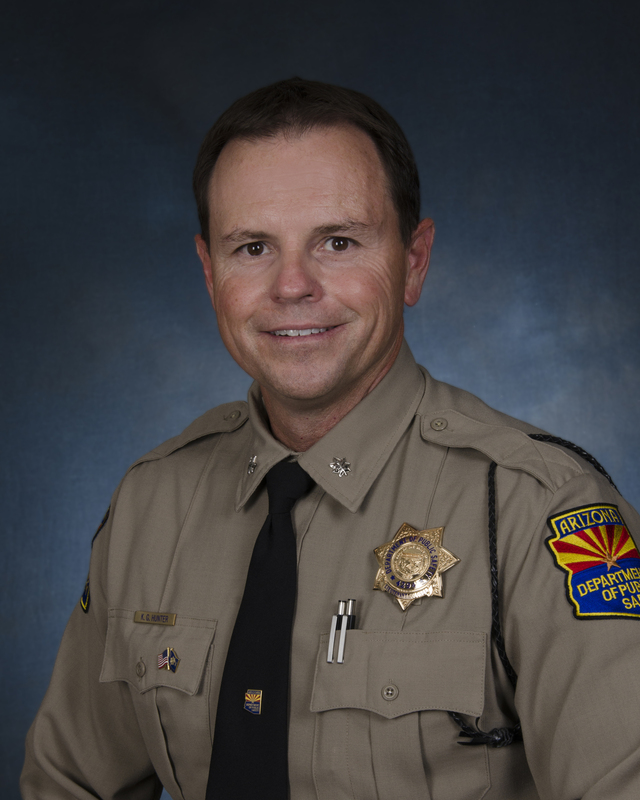 He earned his Certified Public Manager national certification from Arizona State University; a graduate of Harvard Kennedy School, Senior Executives in State and Local Government; the Northwestern University’s School of Police Staff and Command; and International Association of Chiefs of Police Leadership in Police Organizations (LPO) command program. In June 2012, Timothy Chung was promoted from the rank of Major to Lieutenant Colonel and appointed as the Assistant Director of the Criminal Investigations Division. In July 2015, Department of Public Safety Director Frank Milstead appointed Lt. Colonel Chung as the Assistant Director of the Technical Services Division. Lt. 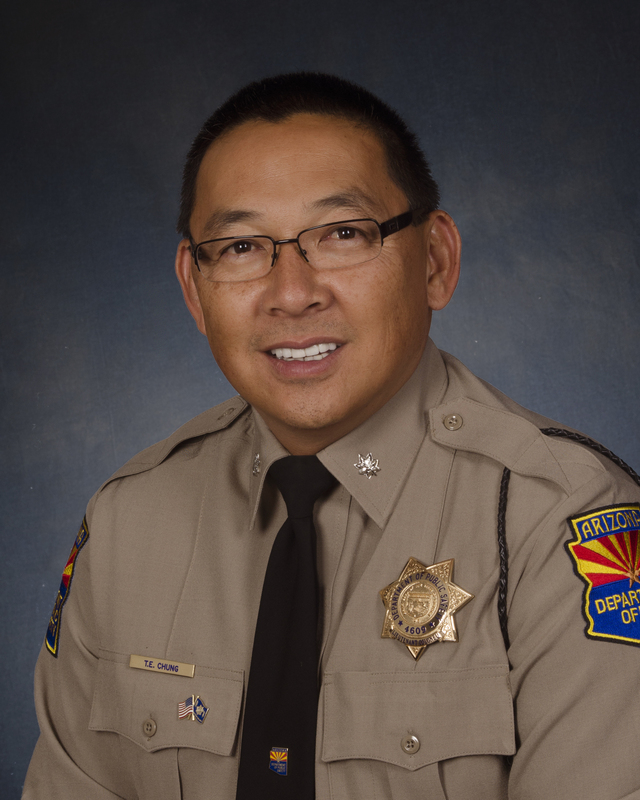 Colonel Chung began his law enforcement career at the La Paz County Sheriff’s Office in Parker, Arizona, in June 1986, where he held the positions of jailer, dispatcher, patrol deputy, investigator, and sergeant. In December 1991, Lt. Colonel Chung joined the ranks of DPS and has held various assignments in each of the Department’s operational and support divisions. As an officer, his first assignment was patrolling the Quartzsite/Parker area. In 1994, he relocated to Phoenix and held assignments in the Vehicle Theft Investigations Unit and the Special Investigations Unit. In 1998, he was promoted to the rank of Sergeant and was assigned to the Highway Patrol Division’s District Eight, in Nogales, Arizona, until he transferred back to Phoenix to oversee the Special Investigations Unit in 2000. In 2002, Lt. Colonel Chung was promoted to the rank of Lieutenant and led the Major Crimes Investigation District. He transferred to an administrative staff position in the Criminal Justice Support Division, currently the Technical Services Division, in 2005. In 2007, he was responsible for forming the Immigration Enforcement District and led the multi-agency Illegal Immigration Prevention and Apprehension Co-op Teams (IIMPACT) and Arizona Fraudulent Identification Task Force. In 2008, Lt. Colonel Chung was promoted to the rank of Major overseeing the Gang Enforcement Bureau which comprised the statewide multi-agency Gang and Immigration Intelligence Team Enforcement Mission (GIITEM). He served as Chief of Staff/Executive Officer for the Technical Services Division from 2009 to 2011. From 2011 until his promotion to Lt. Colonel, he worked within the Director’s Office overseeing the Management Services Bureau. Lt. Colonel Chung has had many accomplishments, received numerous awards, and served on numerous work groups at the Department. 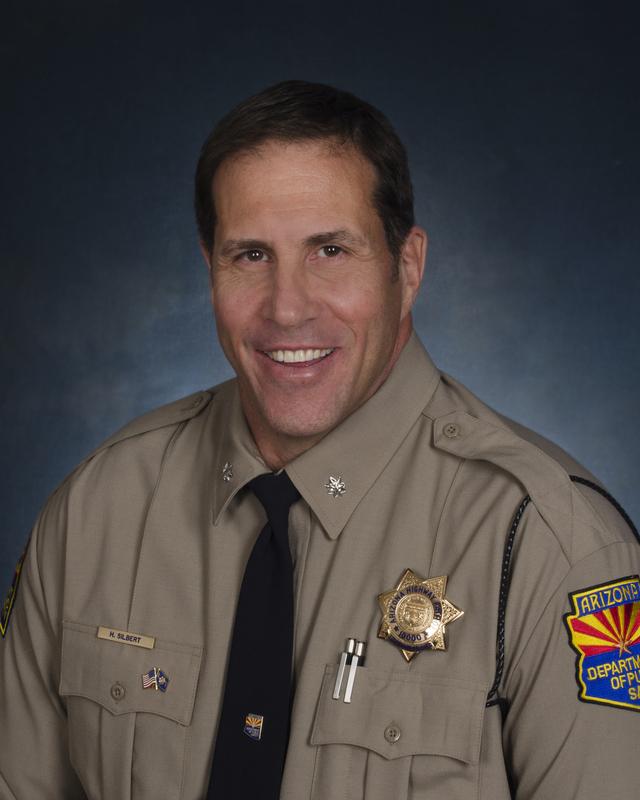 He earned his Certified Public Manager national certification from Arizona State University and is a graduate of Northwestern University’s School of Police Staff and Command, the International Association of Chiefs of Police Leadership in Police Organizations, and the Harvard Kennedy School’s Senior Executives in State and Local Government. He holds an Associate in Applied Science Degree in Law Enforcement Technology, a Bachelor of Science Degree in Occupational Education, majoring in Human Services, and a Masters Degree in Public Administration, specializing in Government Administration. • Governor-appointed First Responder Network Authority (FirstNet) State Single Point of Contact (SPOC) since October 2015.